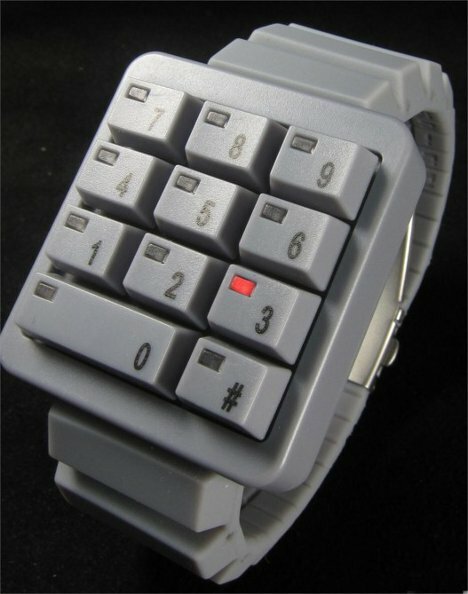 Remember those ridiculously gigantic digital watch/calculators? They didn’t work very well as watches or as calculators, but they were objects of pride for a lot of geeks in the late 80s and early 90s. 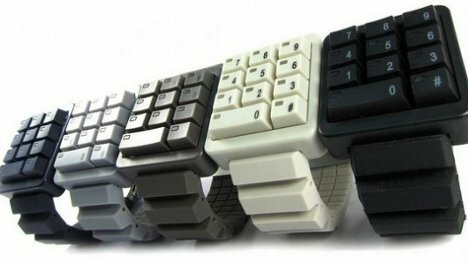 The Click Keypad Watch from Watchismo is a lot like those. It features a huge keypad that looks just like the numeric keypad from a computer. So in what way is this a watch? It has no face and no discernible way of telling the time. Look a little closer and you’ll see a tiny light at the top of each key. Those lights are the secret to the watch’s function. When you tap the zero key, the appropriate keys light up in order to show the time. In the video above, the time is 11:55 as shown by the “1” key flashing twice and then the “5” key also flashing twice. Pressing the pound key makes the same thing happen but for the date instead of the time. Maybe it’s not the simplest watch to read, but it’s nothing if not a conversation piece…and perfect for someone who prefers looking geek to looking chic.